This week, we take a look at a sisterhood event hosted by the ladies of Sigma Kappa. Every sorority hosts sisterhood events for all the members to get together and bond over a f un activity. Activities range from roller skating to an exclusive shopping event at a store. 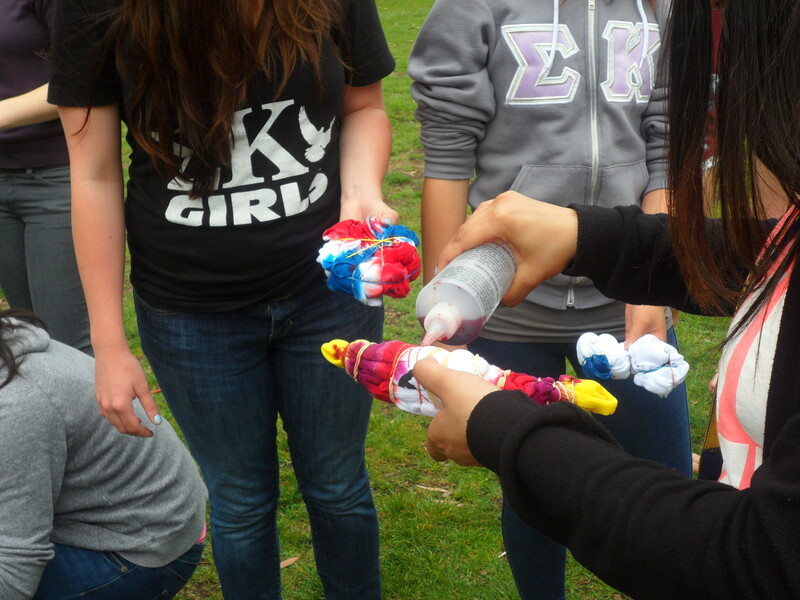 The ladies of Sigma Kappa coordinated a tie dye sisterhood event! The sisterhood took place on a lovely Sunday with perfect weather. 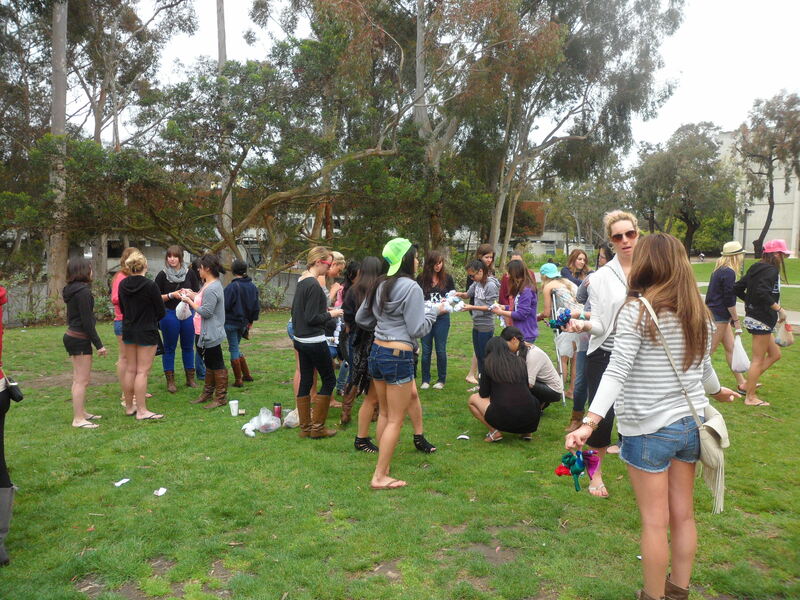 Girls gathered at the Sun God lawn at UCSD for a fun-filled day with their sisters. Sigma Kappa is one of the nine chapters of Panhellenic. With approximately 80 members, Sigma Kappa is one of the bigger chapters on campus. Sisterhood events are one of the ways for members to mingle and get to know each other better since there are so many people in a chapter! Of course, tie dying is fun but can get a little messy. First of all, you need a shirt to work with! 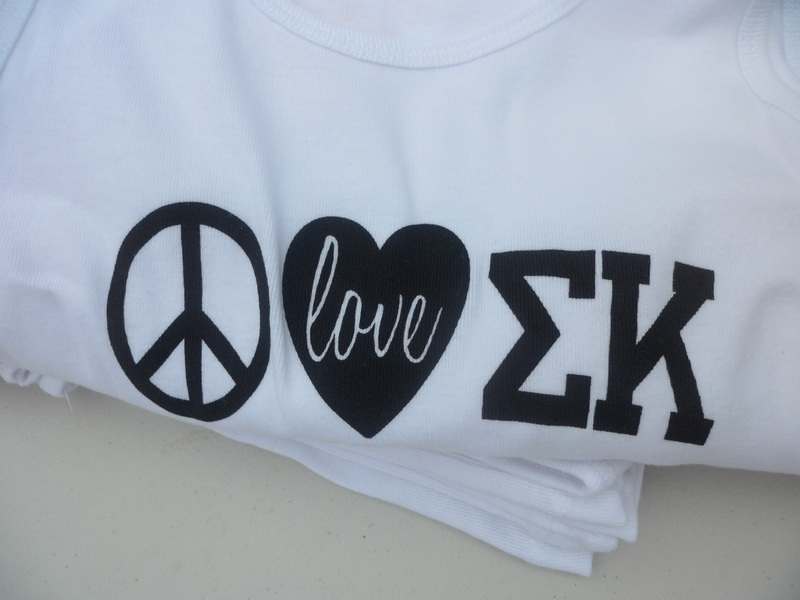 The chapter ordered special customized Sigma Kappa shirts to make this sisterhood more memorable. 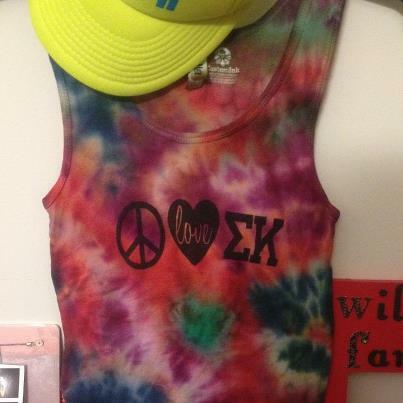 On the shirt, it says “peace love Sigma Kappa” in their Greek letters. Isn’t this adorable? 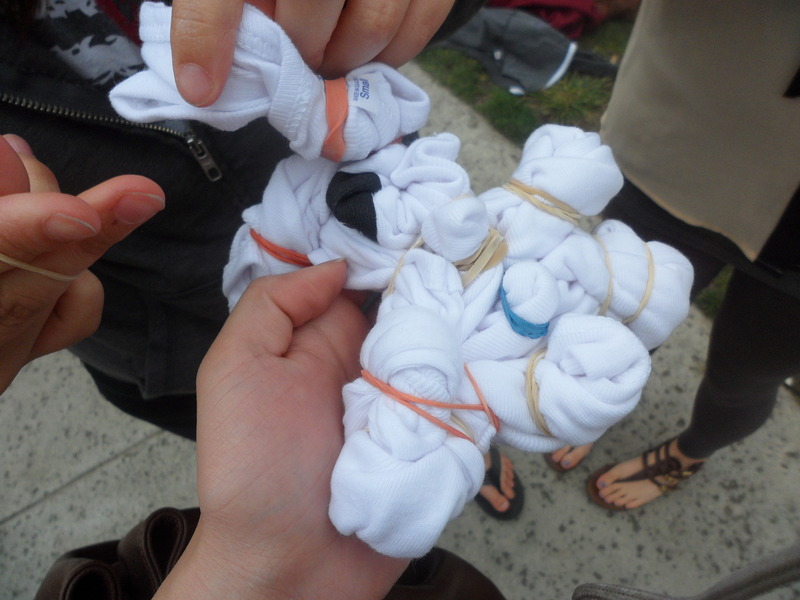 Everyone grabbed a shirt and started the “tie” part of tie dying. The trick here is that you have to twist parts of the shirt into little balls and secure it with a rubber band. The twisted parts then will become patterns once you apply the dye on it. Thus, a lot of twisting and tying were involved for a good 30 minutes. It was their first time tie dying for most of the girls but once they get their hands on it, it was a piece of cake! Looking good and well twisted! Now, it comes to the messy part- applying dyes to the shirt. In order to have the “tie dye” effects on the shirt, you need to dye each individual “ball” with a different color. There are a lot of colors to choose from- yellow, green, orange, purple, red, and blue. Time to go all out on the colors! Turned out not so bad for a first time! That’s it for sisterhood spotlight, thanks for a fun day Sigma Kappa! Remember back in the days when we were kids, we would just want to go to the park and get on the swing? Sigma Chi brought the swing to campus for all the Greeks to relive those childhood memories. Each chapter is assigned a time slot around the clock. It is safe to say that it is a swing marathon! They have people swinging as early as 6am and as late as 12 am at night. 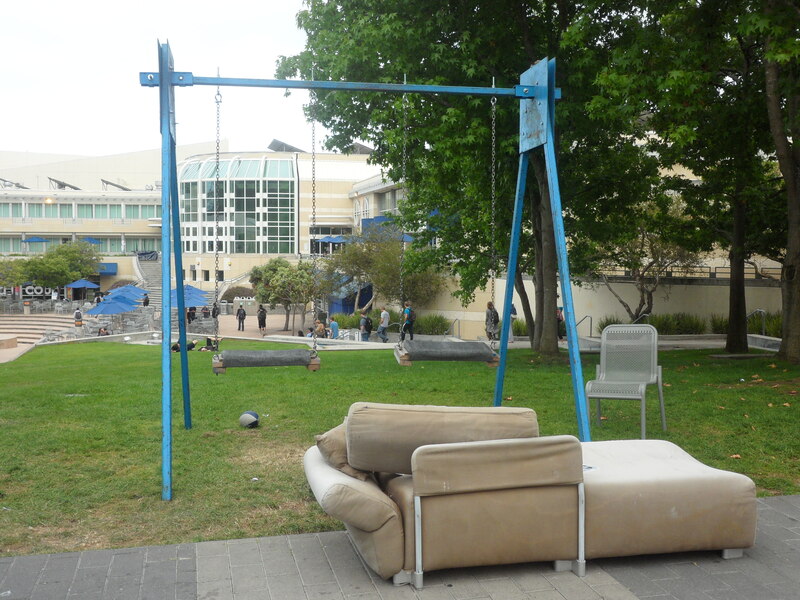 The swing stands on the library walk where everyone can witness the fun that all Greeks have! This shows the dedication of all Greeks in supporting fellow Greek members and awareness for children care. Thursday is perhaps the most eventful day. It is the night of skits and the big concert of the week. Skit nights feature all the Greek chapters and even some UCSD sports team. 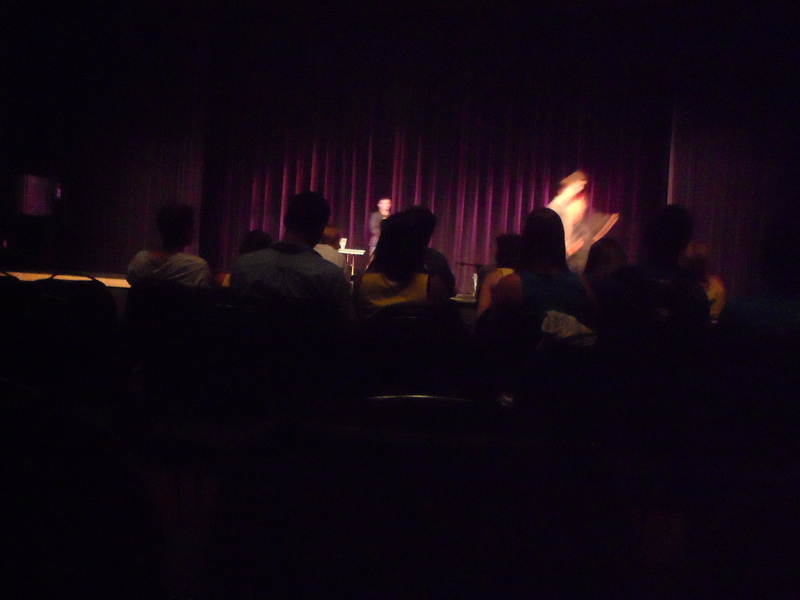 Skit night is hosted at the PC ballroom. Each chapter comes up with skits that are both Olympic and Rady’s themed. Performers show off their best talents whether is dancing or acting. 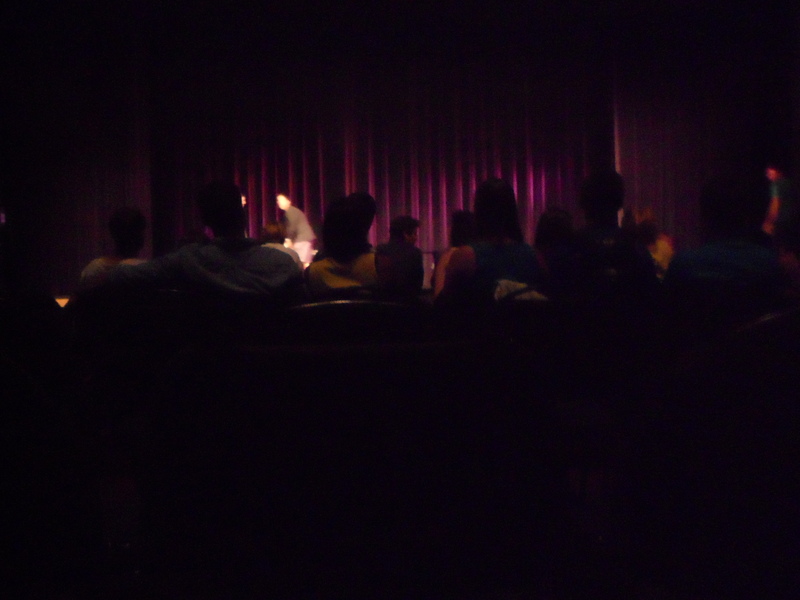 Each performance wowed the crowd and created great laughter. Good job on all your hard and creative work, Greeks! After skit night, it is Inaugural Derby Days concert that is well anticipated. Everyone gets to enjoy live performances by amazing artists- The Lifted, Alier and the Band, and DJ STU! All the proceeds go to Rady’s Children hospital. This concert concludes the 2012 Derby Days. The Gentlemen of Sigma Chi has successfully put on another week of fun but more importantly raised money and awareness for the children at Rady’s hospital. Good work, Greeks! This week is the official Derby Days presented by the gentlemen of Sigma Chi. Derby Days are the annual week-long philanthropic event that help raise money and awareness for medical care for children at the Rady Children’s Hospital San Diego. Rady’s children’s hospital is a non-profit, community based hospital that specialized in pediatric healthcare. 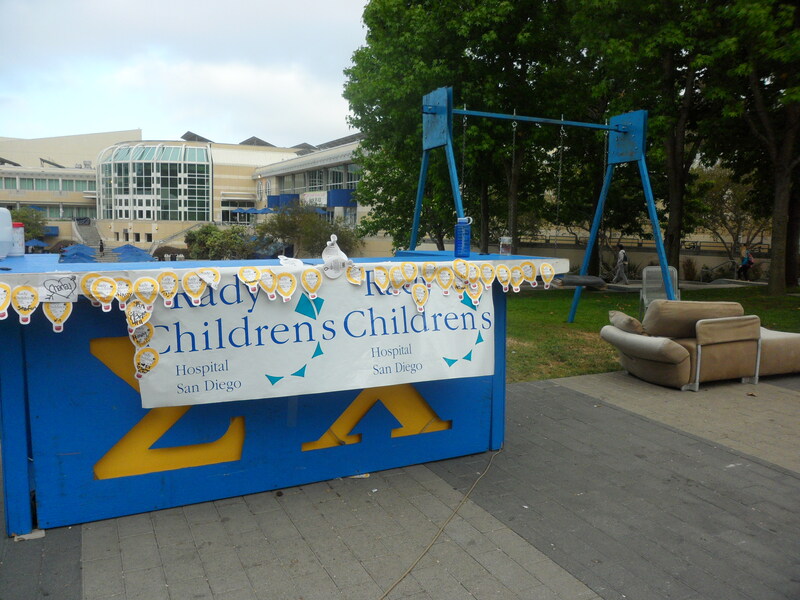 The gentlemen of Sigma Chi has adopted Rady Children’s hospital as their main service project. Derby days are thus presented to get all the greeks together for a fun-filled and philanthropic week! Each day of the week features a different event. All sororities from Panhellenic and fraternities from IFC participate everyday of the week to show support for their fellow Greek chapter. The event that goes on all week is the penny wars where each chapter is designated with a jar and is responsible of filling it with coins! The chapter that gathers the most coins get points into being the winner of derby days. What is a better way to start off Derby Days with a fun yet competitive game of musical chair? One member from each chapter is chosen to participate in the game. The person who does not grab a chair in time has to answer questions about Rady’s children hospital. What an exciting way to kick off the week and get all the Greeks in competitive mode! Tuesday is one yummy day! Each chapter donate delicious and creative baked goods to sell! Since Derby Days are Olympic themed this year, Greeks whip out their creative side and turn cupcakes into art. These baked goods not only taste good but they taste better when you know they are for a good cause! The ladies of Kappa Kappa Gamma from the Zeta Nu chapter at University of California San Diego brought the community another successful and fun Karnival! Kappa Karnival is the annual philanthropy event that the ladies of KKG hosts to raise money and awareness of their dedicated national philanthropy on youth education- Reading is Fundamental. The proceeds of the event goes directly toward not only their national philanthropy but also the local community- San Diego Center for Children. What is a better way to do some good and have some good old carnival fun at the same time? 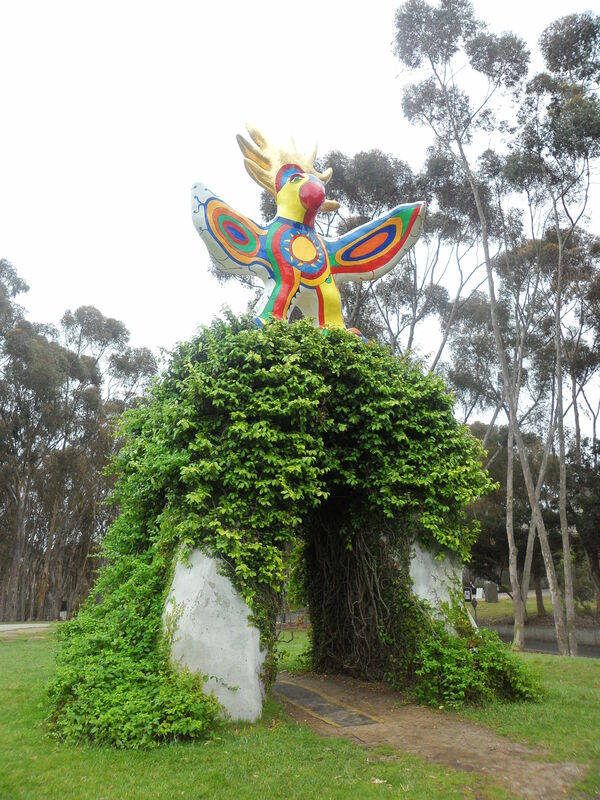 The event was hosted at the Muir field at UCSD. Fraternities and Sororities from IFC (Inter Fraternity Council) and PHC (Panhellenic) all came out to support their fellow Greek chapter. 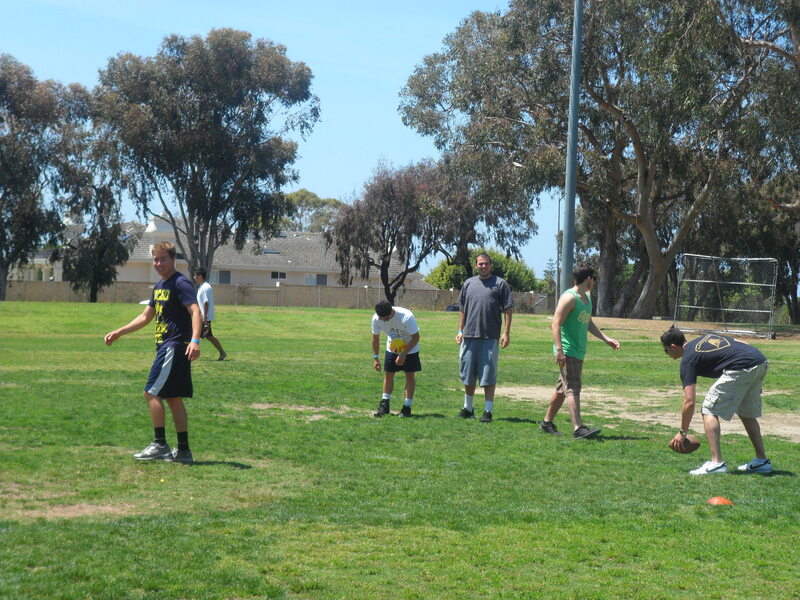 The weather was perfect for some outdoor football and of course mingling for everyone! Each chapter of IFC and PHC hosted a booth for the Karnival. Greeks have creative minds when it comes to their ideas for their booth. The booths ranged from ice cream eating contest, pieing, football toss, and kissing booth. In the picture, the gentlemen of Kappa Sigma hosted a sand pong booth. 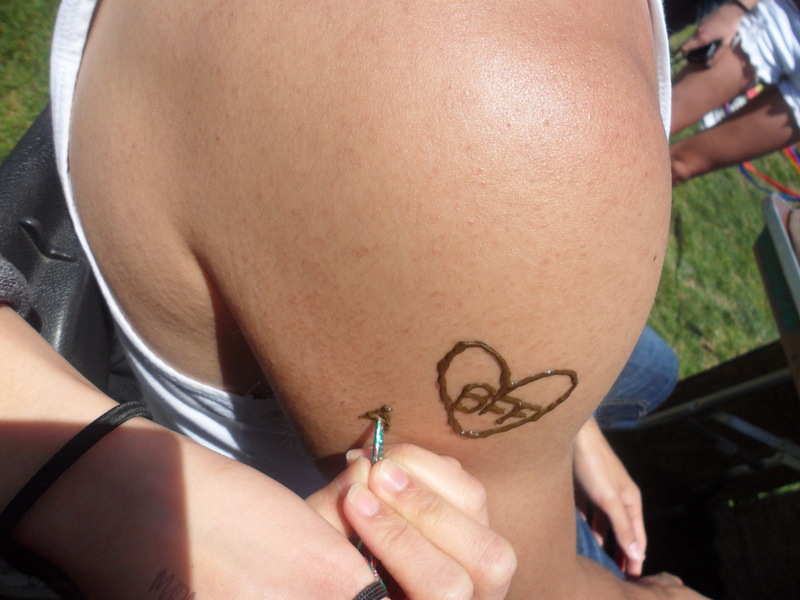 The ladies of Sigma Kappa hosted a henna booth and it was quite a success! Girls put in their artistic skills for whatever the customers demand. Roses, hearts, keys, flowers, letters- you name it! 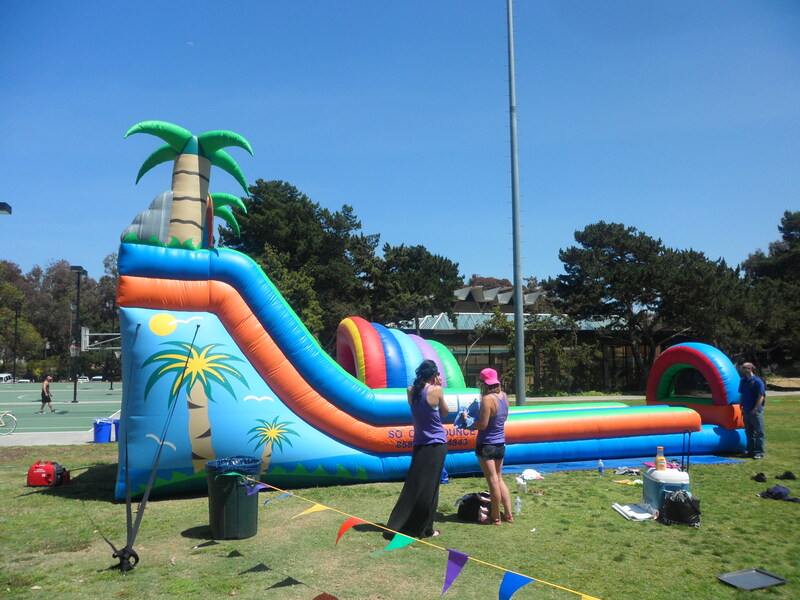 It is not a traditional carnival without some bouncy houses and slides! 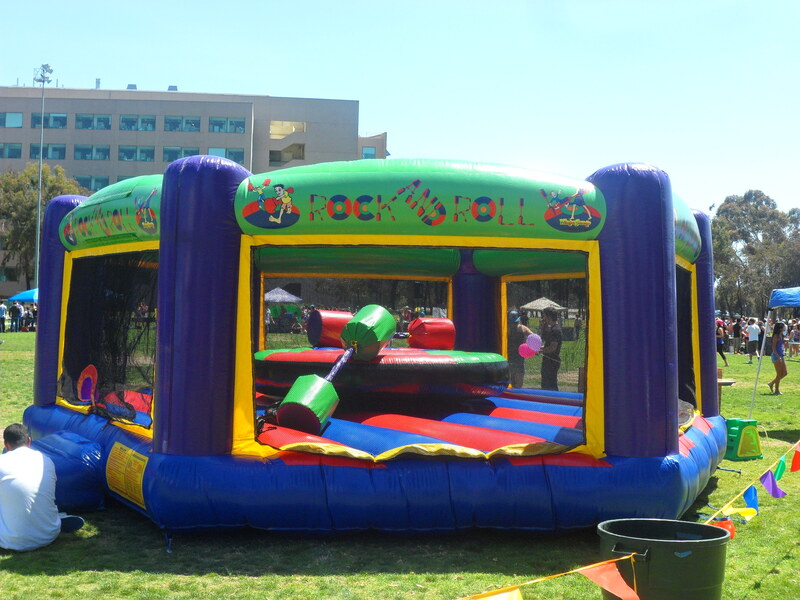 Kappa Karnival goes big when it comes to having some childhood fun! 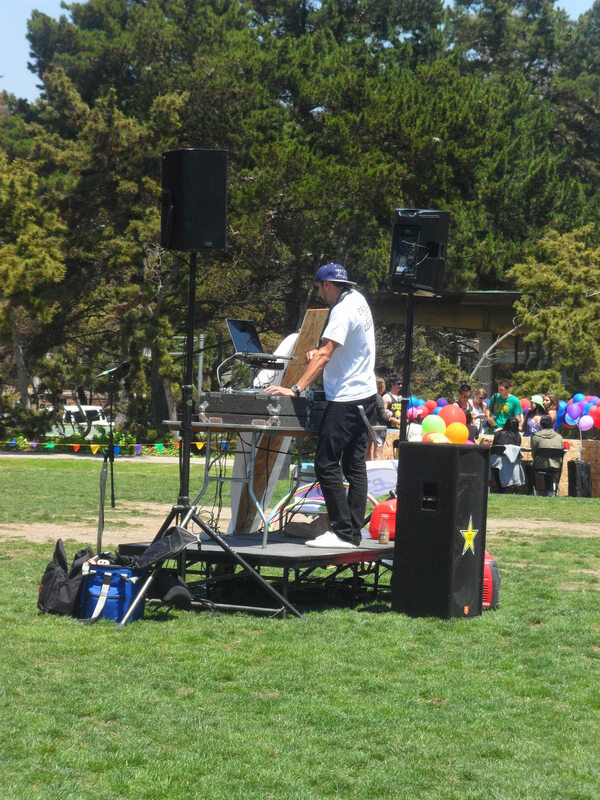 Adding to the fun is LIVE DJ that sets the mood for the Karnival. Everyone feels free to dance under the blue sky and sunshine! Also, classic carnival food such as hot dogs and cotton candy are complimentary with your ticket to get in! Kappa Karnival 2012 was yet another success this year. 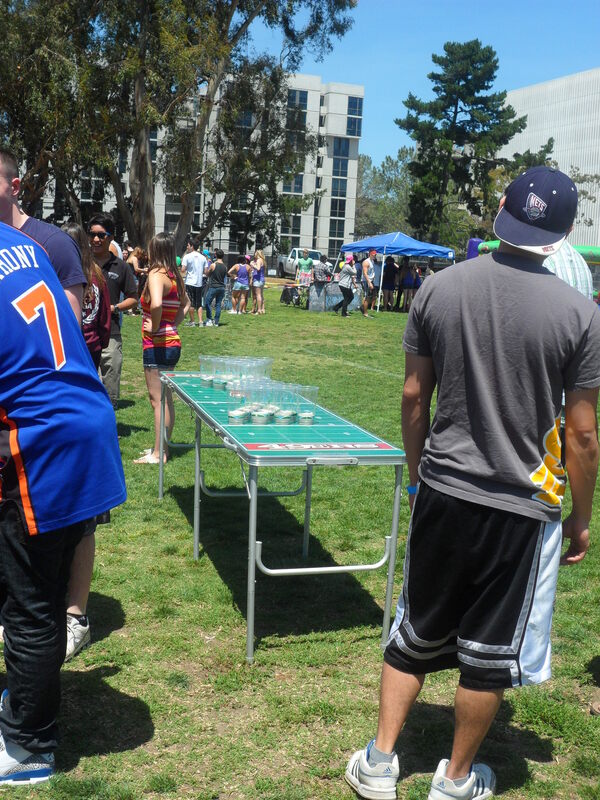 Students, families, and of course all the Greeks from UCSD had so much fun at the Karnival and at the same time raised money for all the children and their education. If you missed it this year, do not worry! 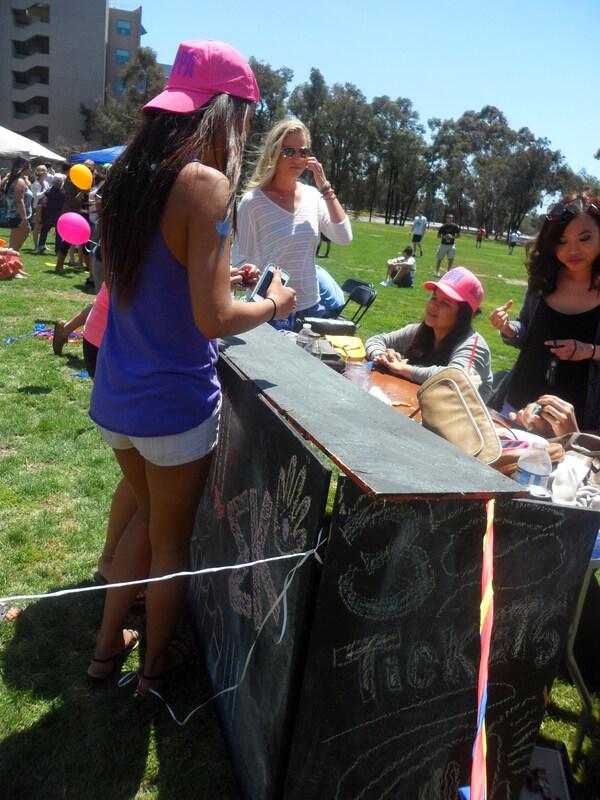 Kappa Karnival is hosted every year by the ladies of Kappa Kappa Gamma. Look out for next year’s Kappa Karnival. Till then, THANKS FOR ALL THE FUN KKG! For more information, visit the Kappa Karnival Official Website.